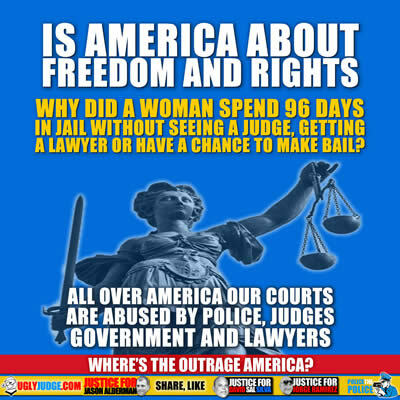 Is America About Freedom and Rights, How Police, Judges, Government and Lawyers Abuse our Courts. 96 Days in Jail on Bogus Charges, It’s no one’s fault? Pulled over for traffic violations, Jessica Jauch was held for 96 days in a Mississippi jail without seeing a judge, getting a lawyer or having a chance to make bail. She was charged with a felony based on a secretly recorded video that prosecutors finally acknowledged showed her committing no crime. Jailed 96 days on bogus charge: It is no one’s fault? Without seeing a judge, getting a lawyer or having a chance to make bail, even though a police video showed she committed no crime. This is not an isolated case, in fact this is common. Courts are suppose to be about justice just as police are suppose to serve and protect. However as video technology has exposed the lies and deceit by police the fact that our courts are used against us is being exposed. Most people think going to court means getting a fair hearing by a non-biased judge. Think again, millions of people are victimized by an unfair, highly biased system based on greed and profit not the lies of justice and equality we expect. The constitution means nothing in our courts, nor do laws when you go up against big money or the system. There are in fact two classes, one which must obey and the other which is above the law. Lets take Cary-Andrew Crittenden who has spent months in jail for a crime he did not commit. While exposing a dishonest judge Socrates Peter Manoukian Crittenden found out just how dishonest police and our courts can be.